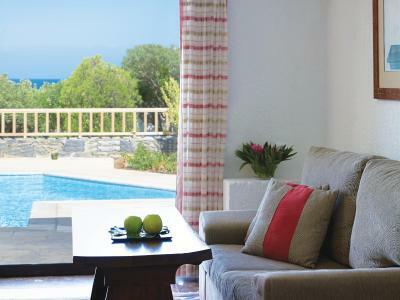 Lock in a great price for Elounda Mare Relais & Châteaux Hotel – rated 9.3 by recent guests! Location. Scenery. 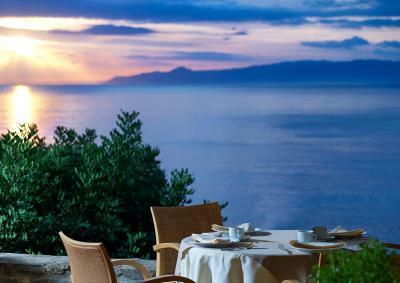 Wide choice of excellent restaurants with great food and nice setting. The atmosphere was one of seclusion and exclusivity with everything as it should be. Breakfast was absolutely exceptional with a vast variety of food catering for all tastes, prepared fresh in the very efficient kitchens. Eating in the hotel restaurants was equally as good although somewhat pricey, especially the drinks - €29 for a G&T and an Alparel Spritz was rather excessive therefore as we were on bed and breakfast, it allowed us to walk into town most nights where there was an endless choice of local and international restaurants each serving first class food. We never once had a bad meal. The views from the private pool villas were amazing. 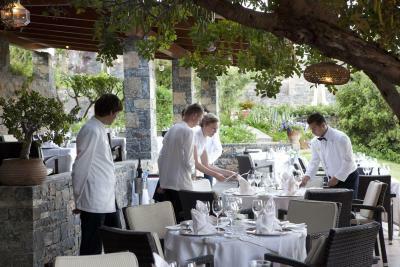 Service and food quality are of a very high standard. 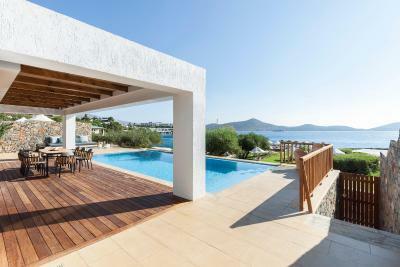 Absolutely fantastic property with excellent facilities located ideally at the beach. The staff is amazing, very caring, professional and friendly. 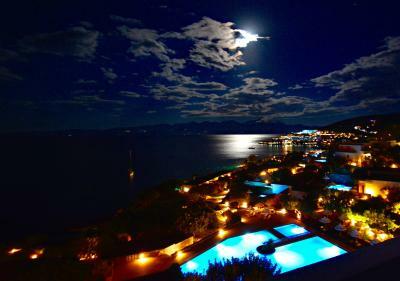 The Elounda Mare is a very special resort. Everything has a very personal touch. The staff was extremely attentive, the food was excellent and beautifully served. The property is very well maintained. We can't wait to return!! Outstanding staff. Very nice property with character, directly at the sea. The staff couldn't have been nicer or more helpful. Nothing was too much trouble. Lovely restaurants in the hotel. Air conditioning was quiet and very effective. If you like a walk it is about 25 minutes into the town, or 5 minutes by car. Lovely hotel. 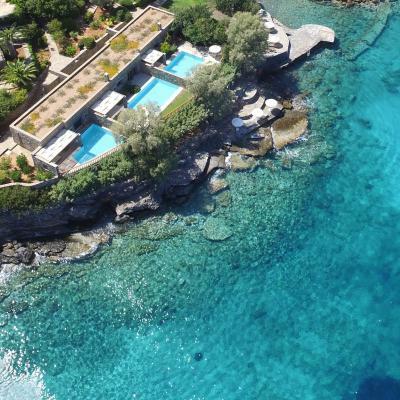 Elounda Mare Relais & Châteaux Hotel This rating is a reflection of how the property compares to the industry standard when it comes to price, facilities and services available. It's based on a self-evaluation by the property. Use this rating to help choose your stay! 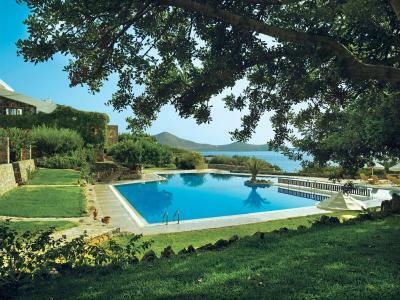 One of our top picks in Elounda.Elounda Mare Relais & Châteaux Hotel features luxurious accommodations with spectacular views over Mirabello Bay. 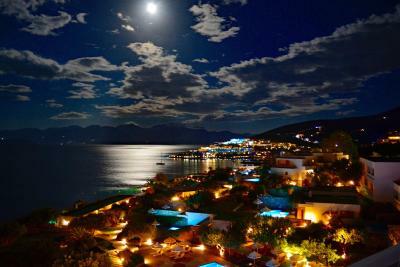 It offers top quality restaurants, along with a variety of leisure activities. 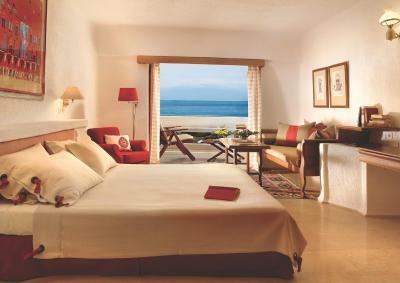 The spacious, whitewashed rooms and suites are elegantly decorated in soft tones creating a serene atmosphere. 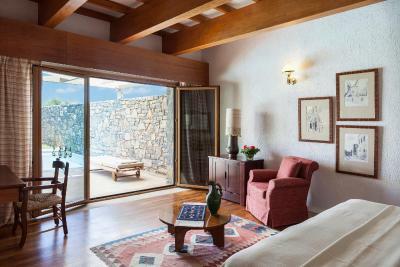 The bungalows are surrounded by bougainvillea-filled courtyards and include private swimming pools. 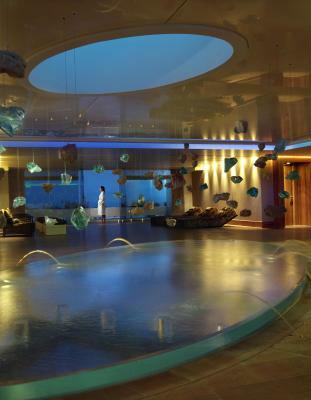 The Six Senses Spa, located in the sister property Porto Elouda Golf & Spa at 1640 feet, spreads over 2,200-m² state-of-the-art facilities including a hammam and a sauna, and offers a wide range of revitalizing treatments. 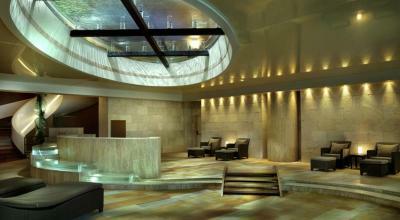 Among others guests can pamper themselves with massage therapies, ayurveda aromatherapy and facial treatments. 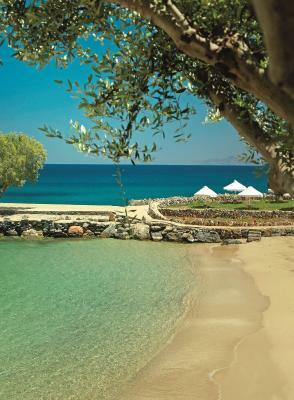 Elounda Mare Relais & Châteaux Hotel features a large outdoor pool, as well as a private sandy, Blue Flag beach, where sun-loungers and umbrellas are provided free of charge. There is also an AstroTurf tennis court with instructors and a gym.The Sea Sports Center offers water skiing and scuba diving lessons. Other water sports such as canoeing, wake boarding and wind surfing are available. 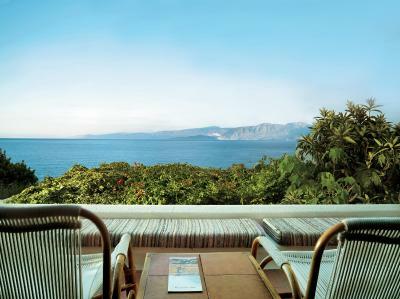 A rich buffet breakfast is served at the Deck restaurant with its sea-view veranda. 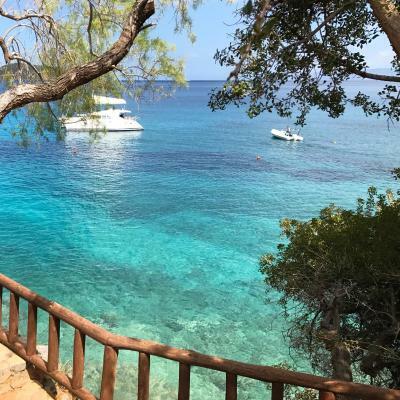 The Yacht Club offers fish specialties by the beach, while the Old Mill restaurant specializes in Cretan gourmet cuisine. A beach bar is also available. 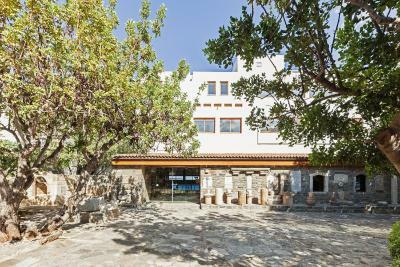 Other Elounda Mare facilities include a children’s entertainment center at the sister property, a 9-hole golf course also at the sister property, and a shopping arcade. 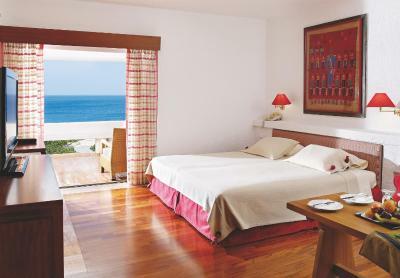 Free private on-site parking is possible, while free transport within the hotel is also provided. Free shuttle to the sister property is also provided. 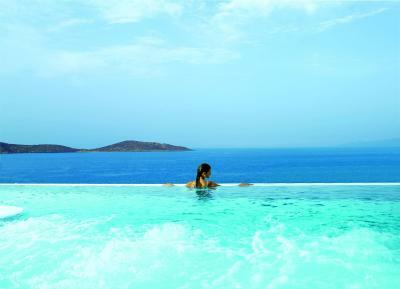 When would you like to stay at Elounda Mare Relais & Châteaux Hotel? 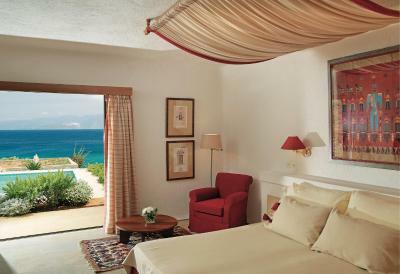 This elegantly decorated room has an en suite marble bathroom, a seating area and a furnished balcony with views over Mirabello Bay. An extra child can be accommodated upon request. 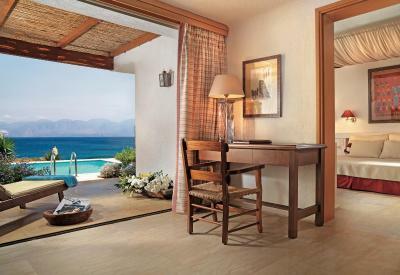 Elegantly decorated in soft tones, this suite has a separate bedroom, a seating room and en suite marble bathroom. 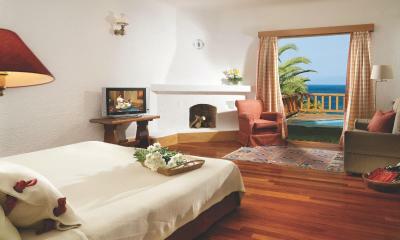 It offers views over Mirabello Bay. An extra person (adult and / or child) can be accommodated upon request. Elegantly decorated in soft tones, this spacious suite has a separate bedroom, a seating area and an en suite marble bathroom. 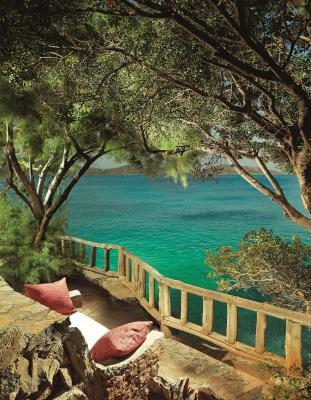 It offers views over Mirabello Bay. 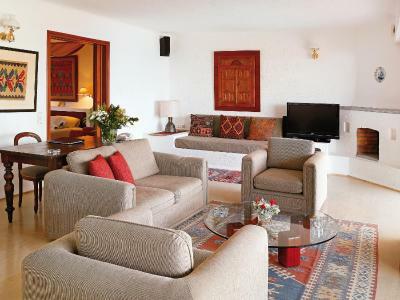 Either one spacious unit with sitting area or separate sitting room. 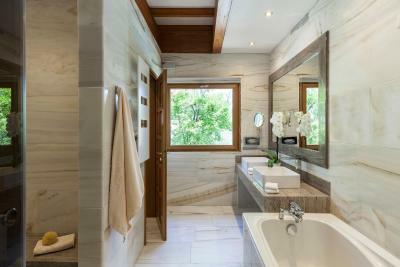 Private marble bathroom and open fireplace, as well as a furnished private small garden/terrace and private sea water swimming pool. 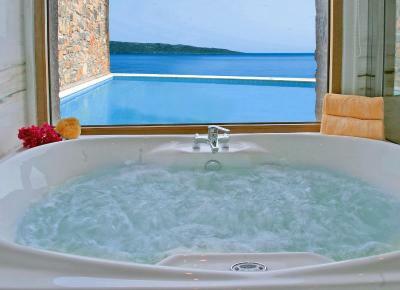 Offers more privacy and wonderful view of the sea. An extra person (adult and/or child) can be accommodated upon request. 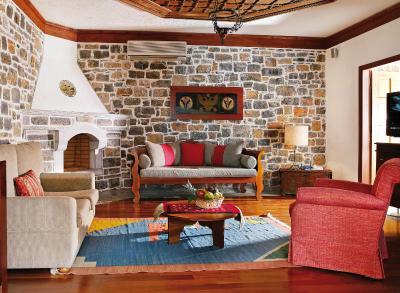 This suite has a separate bedroom and sitting room, with private marble bathroom. 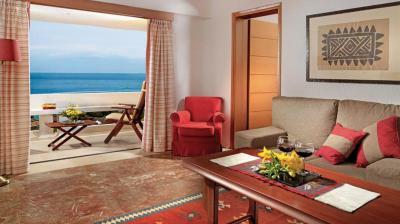 It is larger and more luxurious than a regular suite. Either one spacious unit with seating area or separate seating room. 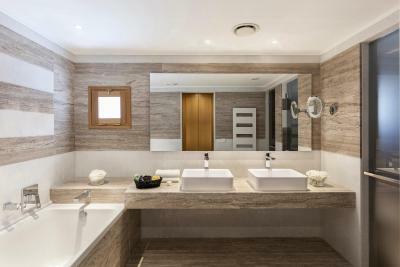 There is an en suite marble bathroom and open fireplace, as well as a furnished private small garden / sun terrace and private sea water swimming pool. Spacious unit with a sitting area or separate sitting room. 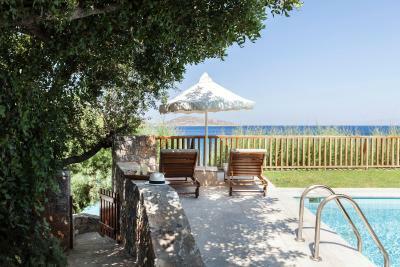 Highlights include furnished private small garden with terrace and private seawater swimming pool with superb sea view. 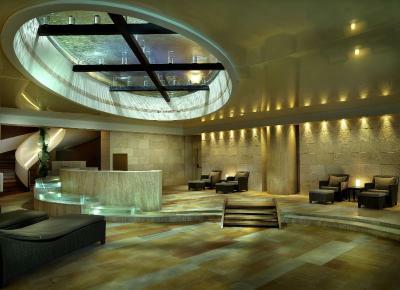 - all treatments include complimentary consultation, use of steam, sauna, Six Senses ginger tea and super-food snack. 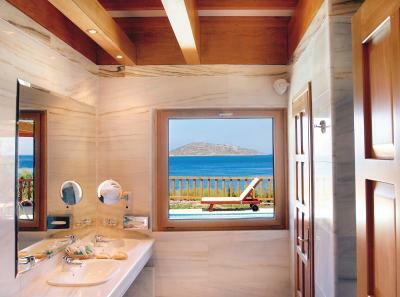 In these uniquely designed bungalow suites, the bedrooms have their own en-suite marble bathroom and are complemented by a spacious living room, an open fireplace and a private furnished garden with a sun terrace and private seawater swimming pool. 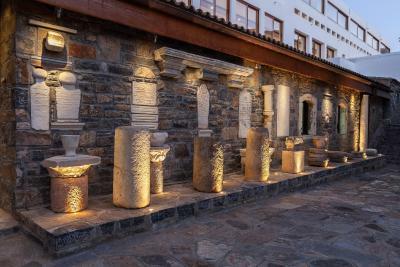 They are located on the front row near the sea, offering unobstructed views of the Aegean Sea and the distant Sitia Mountains. "Beyond words" is what everybody says about the friendliness of the wonderful people staffing every position at the Porto Elounda. 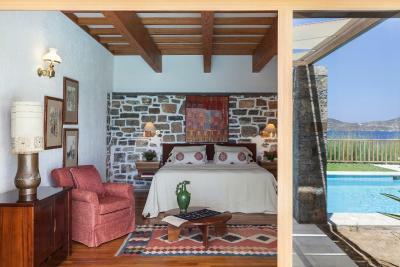 The personal touch is everywhere, with the family of owners there to greet you and have a drink with you, talk about the history and legacy of Elounda, and share the story through the book written by Spyros Kokotos, the master architect behind this whole region. 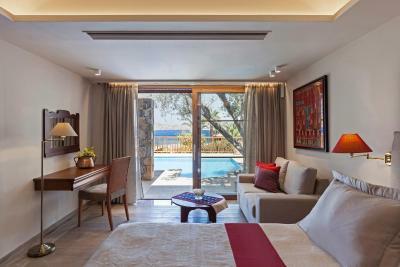 House Rules Elounda Mare Relais & Châteaux Hotel takes special requests – add in the next step! 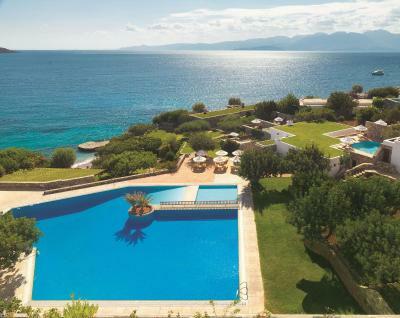 Elounda Mare Relais &amp; Châteaux Hotel accepts these cards and reserves the right to temporarily hold an amount prior to arrival. Elounda Mare Relais & Châteaux Hotel accepts these cards and reserves the right to temporarily hold an amount prior to arrival. In case the booking is canceled after the deadline, the deposit is kept and can be used in full for a future reservation within 2 years. Please note that Elounda Mare Relais & Châteaux Hotel participates in the Greek Breakfast Initiative by the Hellenic Chamber of Hotels. 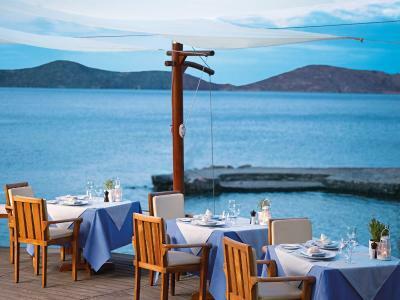 The "Dine Around" offers dining at the a la carte restaurants of the Elounda Peninsula All Suite Hotel, the Elounda Mare Hotel Relais & Châteaux and Porto Elounda Golf & Spa Resort. Upon arrival, you will be provided with vouchers for the relevant restaurants. Dine around is available from 01/05/2018 until 30/09/2018. No kettle in the room or tea facilities and sun beds not very comfortable. Layout gave a private feel. The price of drinks which were more than one would expect to pay forcing some residents to walk or take a taxi into the village of Elounda to drink in local bars but then if you want exclusivity and are prepared to pay over the odds in the hotel then that is your choice. Otherwise we could not fault the whole experience. The spa was closed on Tuesday, which was not advertised and was inconvenient. This is a spa resort and we would expect the spa to be open daily during the holiday season. Room was very dated, badly needs refurbushment. Prices are really to high for age of resort (built in the 1980’s) and in comparison to many other resorts on the Island. At least 40-50% overpriced. And it is not really special. There was some garbage in the sea at times and the sandy beach was in fact a bit small. Also, the prices in the restaurants are way too high so it made more sense to grab a taxi and have lunch and dinner in Elounda paying in total half the price with the quality being the same. Great food, great service and a great experience. 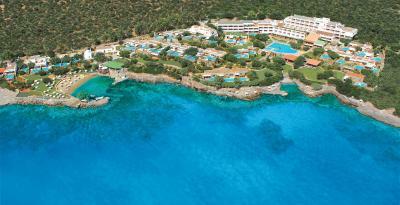 We loved everything about Elounda Mare!! Spectacular hotel with gorgeous old world charm. Average food choice. Most activities and restaurants require shuttle or 500m-800m walk. WiFi miserable.